This is my (private) gallery on the Mornington Peninsula (near Melbourne), Victoria, Australia. Those who love art, both knowledgeable and less knowledgeable, are most welcome to come and have a look and a chat. If you would like to do this, please send me an email (gee@geeryan.com) with your name and phone number .. and I'll then call you to arrange a time that suits. I have painted naturally since childhood and am primarily interested in the power of colour to celebrate the mysteries that surround us. It is only since February 2015 that I have been publicly showing my art. To date (November 2017), I have had three exhibitions .. in 2015 at Merricks House Art Gallery at Merricks General Wine Store, Merricks, Mornington Peninsula; in 2016 at Whitehill Gallery & Sapori di Casa Restaurant, Dromana, Mornington Peninsula; and in 2017 again at Merricks House Art Gallery at Merricks General Wine Store. My paintings reflect my central belief that, in order for humanity to achieve a peaceful and lasting future, each of us needs to live our life in accordance with two principles: love one another .. and .. care for our planet. The three Masters who, in various ways, have had the greatest influence on me are in order: Leonardo da Vinci, Henri Matisse and Mark Rothko. And the other Masters who have greatly influenced me are in order: Claude Monet, Edvard Munch, Paul Cézanne, Pablo Picasso, Vincent van Gogh, Andy Warhol, Sir Sidney Nolan, JMW Turner and Amedeo Modigliani. In Paper #15 on my geeryanhealth.com website, I explain a NEW MIRACLE by Jesus Christ based on a new interpretation of the washing by Jesus of the feet of his Disciples at the Last Supper and the words he used to explain what he was doing and why. The washing of feet and words are recorded in the Gospel of John at John 13:1-20. In my view, they were intended by Jesus NOT to be understood until this current era (see John 13:7). To understand the New Miracle, please see Paper #15 on geeryanhealth.com. Immediately after this Last Supper washing of feet (John 13:1-20), Jesus then FIVE times gave his instruction "love one another" meaning love ALL others. By this giving of the instruction five times, Jesus made it clear that this was his CENTRAL instruction. See John 13:34 (twice), John 13:35, John 15:12 and John 15:17. In my view, the purpose of the New Miracle is to persuade ALL people to follow the central instruction of Jesus "love one another" meaning love ALL others. That is, for each and every one of us .. regardless of whatever religious beliefs or spiritual beliefs we may hold and regardless of holding no such beliefs at all .. to "love one another" meaning to love ALL others. My Love One Another Basin series of paintings shows my depiction of the basin in which Jesus washed the feet of his Disciples at the Last Supper, immediately prior to giving his “love one another” instruction. See John 13:5 for the reference to the basin. Below is one of the paintings from the series. 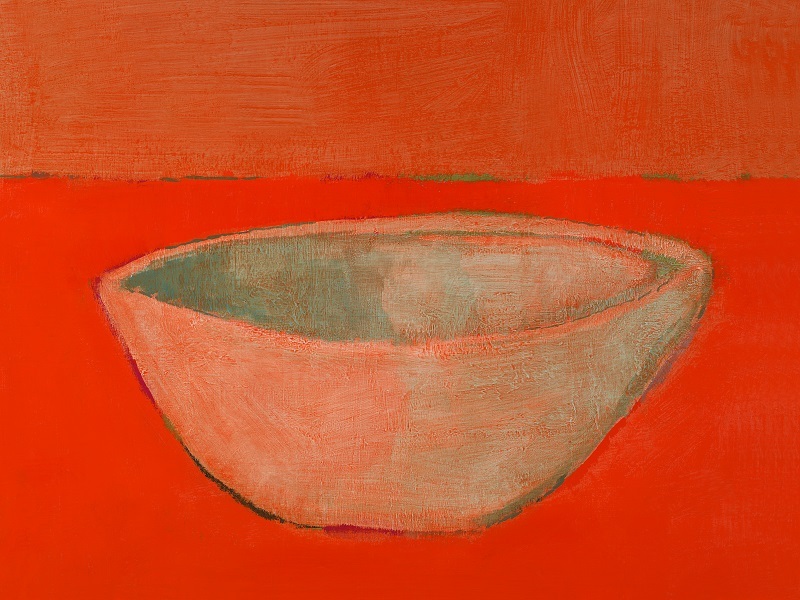 Love One Another Basin (in brilliant red oranges with greens and greys), Gee Ryan (Gerald), 2016. Archival pigment inks and synthetic polymer paints on canvas. H 18 x W 24 inches (45.7 x 60.9 cm). * Large paintings (average size of approx 168 x 168 cm) .. four sold .. for $7,500, $7,400, $7,200 and $7,200. * Medium-to-larger paintings (average size of approx 136 x 120 cm) .. six sold .. for $6,000, $6000, $5,000, $5,000, $5,000 and $4,800. * Medium paintings (average size of approx 122 x 91 cm) .. 11 sold .. for $4,600, $3,200, $3,000, $3,000, $3,000, $3,000, $3,000, $3,000, $3,000, $2,400 and $2,400. * Medium-to-smaller paintings (average size of approx 31 x 25 cm) .. eight sold .. for $1,500, $1,500, $1,500, $1,400, $1,400, $1,250, $1,250 and $1,250. * Small paintings (average size of approx 25 x 20 cm) .. two sold .. for $1,250 and $600. That is a total of 31 paintings sold for a total of $107,600 .. an average of $3,470 each. The purpose of the above information is to assist potential buyers in forming a view on price.